All Saints Academy is pleased to congratulate three of our fantastic students for their success in Darlington Building Society’s 500-word writing challenge. Amazingly, Kayden Robinson, Ben Rogers and Harvey Jackson-May were all finalists for their ‘Little did I know…’ stories. All students across the academy had the opportunity to enter the competition with stories from nearly every genre and timeframe being submitted. The final of the competition took place at Darlington’s Hullabaloo Theatre with an invited audience. Ben Rogers was crowned the overall secondary school winner for across the region. 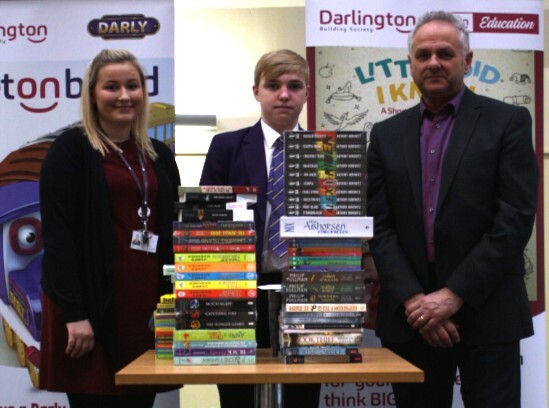 As a result of coming first, Ben has won £500 worth of books for All Saints’ Academy library as well as his own height in books for himself and an incredible trip on the North Yorkshire Moors Railway. Esther Scott who organised the competition from Darlington Building Society and Peter Barron (author and previous editor of the Northern Echo) delighted the students of All Saints by presenting Ben with his prizes during a special assembly on 20th March. Both were extremely impressed by Ben’s exceptional talents and the emotive narrative voice he created. Miss Gavaghan and Miss Jenkins praised all of the students who participated in the competition. Additionally, his story will also be published in The Northern Echo and featured on TFM Radio. Ben’s winning story was a touching piece based on a boy, whose mother had passed away, aiming for Olympic glory - make sure you listen out for the piece as it will be featured on the radio. Congratulations to the winner Ben and the two finalists, Kayden and Harvey!